The 2018 Audi Q3 small premium crossover range has a reshuffle of equipment to make it more tempting. 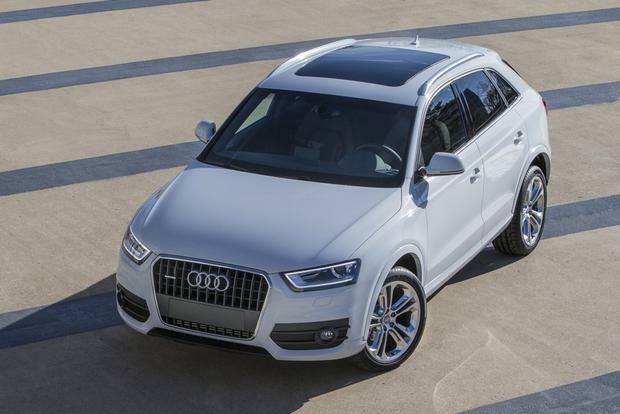 2016 Audi Q3 vs. 2016 Audi Q5: What's the Difference? We're comparing Audi's smaller luxury SUVs -- the Q3 and the Q5 -- to find out exactly what sets them apart. The all-new 2015 Audi Q3 actually isn't that new overseas; drivers in China and Europe have been rolling in this little crossover for about 5 years now. This is the first we're seeing of the Q3, because back when it came out, Audi figured that American drivers wouldn't be interested in a genuinely compact SUV. How quickly things change, right? High-riding runabouts such as the BMW X1 and MINI Countryman have shown that Americans don't need to supersize everything, and the tidy new Mercedes GLA-Class is about to get a piece of the action, too. With the Q3, Audi finally has a contender in this fast-growing segment. Loosely related to the Volkswagen Tiguan crossover, the Q3 is a full 10 inches shorter in length than its Q5 sibling, and its wheelbase is 8 in shorter. Not surprisingly, it provides considerably less room for both rear passengers and cargo. If you don't mind the hatchback-size interior, the Q3's elevated driving position, city-friendly dimensions and relatively reasonable pricing could tip the scales in its favor. 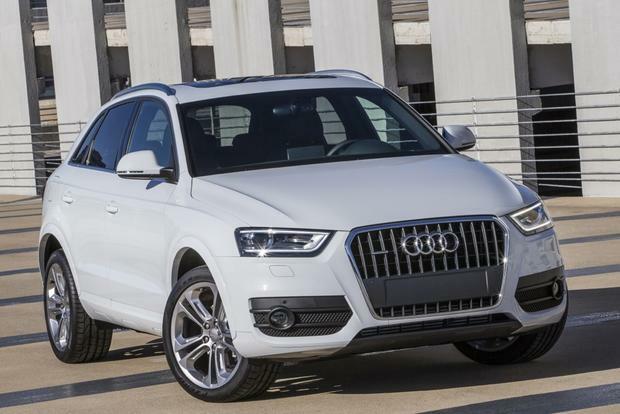 This is the Q3's first year on the U.S. market. 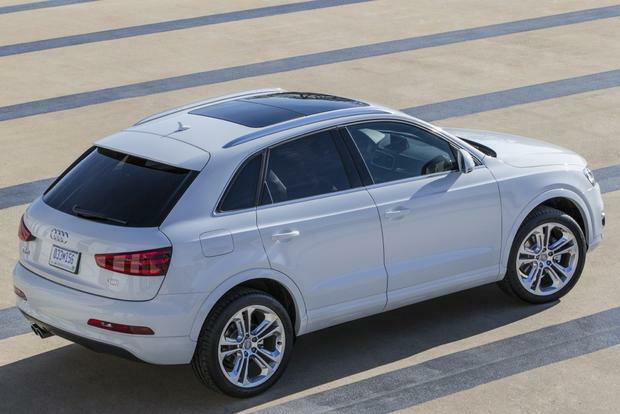 The 2015 Q3 comes with either front-wheel drive or Audi's quattro all-wheel drive. Either way, the transmission is a 6-speed automatic, and the engine is a turbocharged 2.0-liter 4-cylinder rated at 200 horsepower and 207 lb-ft of torque. According to the Environmental Protection Agency, the Q3 returns 20 miles per gallon in the city and 29 mpg on the highway with front-wheel drive and 20 mpg city/28 mpg hwy with all-wheel drive. 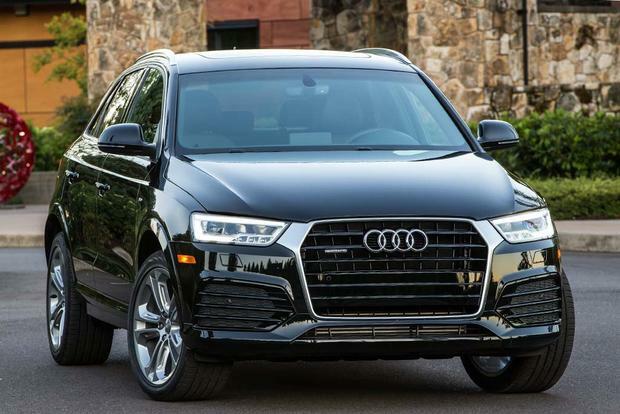 Surprisingly, the larger, heavier Q5 also gets 20 city/28 hwy with its 4-cylinder engine and all-wheel drive (front-wheel drive is not available). 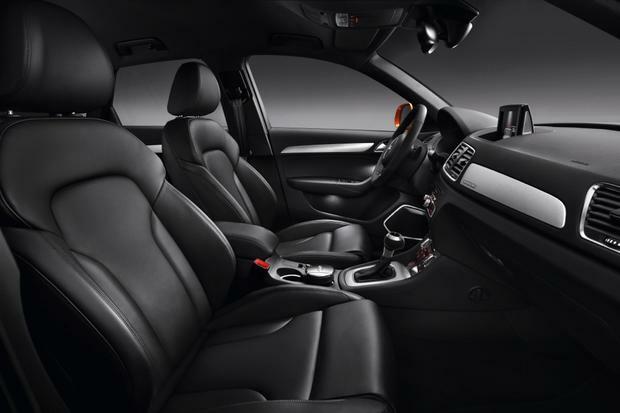 The 2015 Audi Q3 is offered in two trim levels: Premium Plus and Prestige. Note that all-wheel drive is a $2,100 option on either trim. The Premium Plus ($33,425) comes standard with luxuries such as 18-in alloy wheels, automatic xenon headlights, fog lights, a panoramic sunroof, keyless entry and ignition, ambient LED interior lighting, leather upholstery, 12-way power heated front seats, dual-zone automatic climate control, an auto-dimming rearview mirror, 60/40-split folding rear seatbacks with a center pass-through, a monochromatic trip computer, a backup camera, Bluetooth phone and audio connectivity and a 10-speaker audio system with iPod connectivity, an SD card slot, HD radio and satellite radio. The Prestige ($37,325) adds a power lift gate, a color trip computer, Audi's MMI infotainment system with a dash-mounted controller and a 7-in display screen, a navigation system, Audi connect (including mobile Wi-Fi, Google Earth map imagery and Google Points of Interest search), voice controls, a blind spot monitoring system, front and rear parking sensors, a backup camera and a 14-speaker Bose audio system. The MMI system (including the color trip computer) can be added to the Premium Plus trim as an option, though the Audi connect system is exclusive for the Prestige. Also available on the Premium Plus are the Prestige's safety items and power tailgate. Optional on both trims are 19-in wheels and a Sport package that includes a sport steering wheel with shift paddles, sport front seats and Audi drive select (providing adjustable drive modes with specific steering, throttle and transmission calibrations). The 2015 Q3 comes standard with anti-lock disc brakes, stability control, hill-descent control and six airbags (front, front-side and full-length side-curtain). Available features include a blind spot monitoring system and a parking system with proximity sensors and a backup camera. Due to its older design, the Q3 lacks cutting-edge features such as adaptive cruise control, a forward-collision mitigation system or lane-keeping assist. 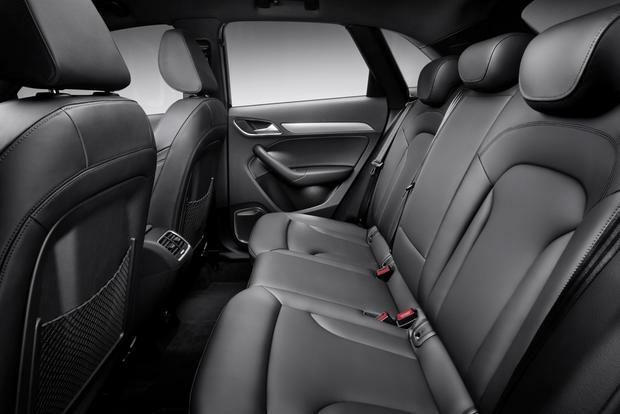 In our interior evaluation, we found that the 2015 Q3 mostly meets Audi's high standards in terms of materials and build quality. Relative to the Q5, the biggest technological downgrade is that the Q3 Premium Plus doesn't come standard with the MMI system at all, while the Q3 Prestige's MMI setup (optional on Premium Plus) features a dashboard-mounted controller that may require an awkward reach to operate. In the Q5, the dash-mounted version comes standard, and the upgraded version boasts a superior console-mounted controller that simply isn't available on the Q3. Of course, if you want that upgrade on a Q5, it's going to cost you. The Q3's standard front seats serve up plenty of firm support for long hauls, and we like that both seats get the same power adjustments (8-way positioning plus 4-way lumbar). The special seats that come with the Sport package add prominent side bolsters, which are perhaps too prominent for the typical crossover shopper. Predictably, the pint-sized Q3's rear accommodations are cramped for adults, and cargo capacity measures a very modest 16.7 cu ft. behind the rear seatbacks, expanding to 48.2 cu ft. with those seatbacks folded down. On the road, the refined 200-hp turbo four feels stronger than the projected 7.8-second sprint to 60 mph suggests (8.2 seconds with all-wheel drive). Still, there's no denying the fact that this is an older engine used primarily in Volkswagen products -- including the related Tiguan -- whereas the Q5 and most other Audi vehicles sport a different turbo four with a bit more power and a lot more torque. The 6-speed transmission is also a bit of a relic; most Audis have upgraded to an 8-speed transmission. Like the engine, though, it doesn't feel outdated, even if it technically is. In corners, the Q3 is capable enough, but we wouldn't call it a performance-oriented crossover. Where it really shines is on the highway, where the compliant-yet-composed ride constantly reminds you of the Q3's luxury status. We've mentioned the Tiguan parallels, but the Q3's suspension is actually a mash-up of multiple Volkswagen and Audi platforms -- and you can feel the difference. It's an appropriately upscale driving experience. BMW X1 -- The aging X1 is nearing the end of the line, but it's still a blast from the driver's seat -- and its cabin is pretty versatile. Mercedes-Benz GLA 250 -- The new GLA 250 is the Q3's most direct competitor. It's a sportier drive than the Audi is, though its interior materials pale by comparison. MINI Countryman -- The Countryman has even less cargo space than the Q3 does, but its nifty sliding rear seat means adults can ride back there without issue. Plus, the MINI is more fun. 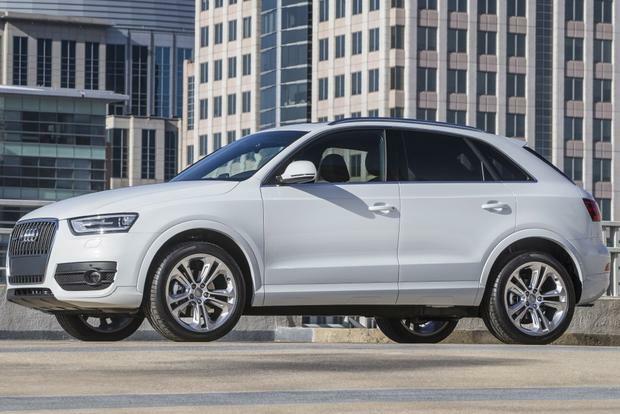 Used Audi Q5 -- A nice certified pre-owned Q5 will cost you about the same as a brand-new Q3. Provided that you're not intimidated by the Q5's increased size, we think you're going to like its generally enhanced features and capabilities. 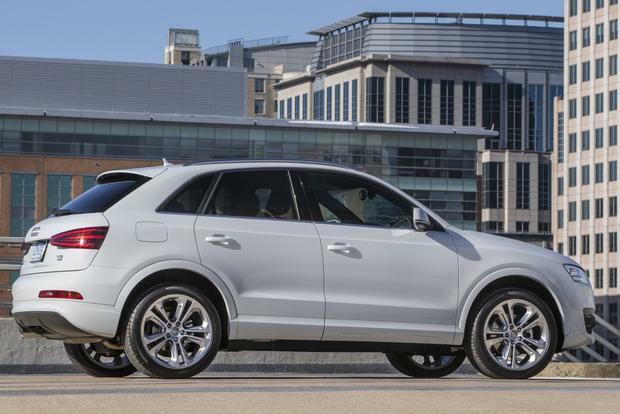 An entry-level Q5 starts at $39,825 for 2015, so even the Q3 Prestige has a relatively attractive price. This isn't Audi's freshest model by any means, but if space is at a premium where you park, the Q3 just might make sense.